GB Boxing welcome China to the city by hosting an evening of boxing, where the GB Boxing team will face China in a city duel. The dinner show will be held at the Holiday Inn Royal Victoria in Sheffield on Tuesday 7th November (doors open at 6.30pm). Tickets are on sale now, priced at £80 plus vat for a single ticket, a table of 10 is £800 plus vat and a table of 12 will be £900 plus vat. Tickets can be purchased through MLS on 01142573170 or by emailing support@mlsgb.co. 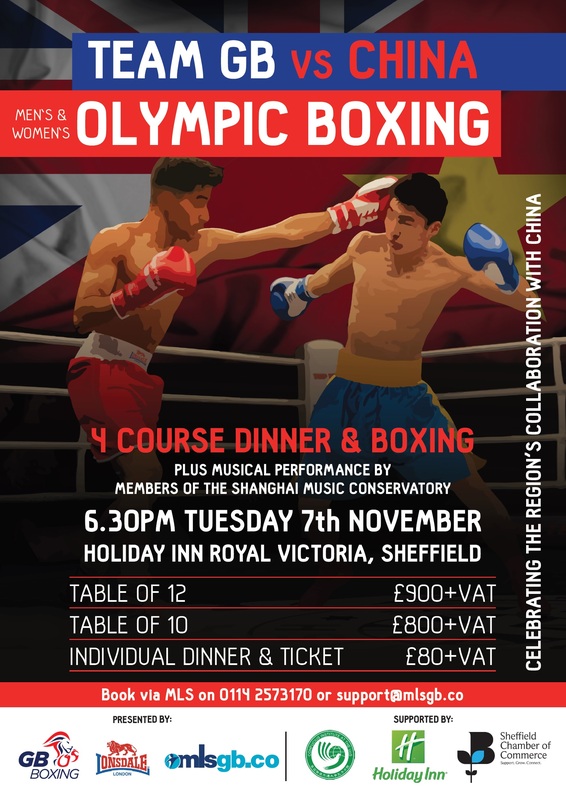 The evening will include a four course dinner and boxing, plus there will be a musical performance by members of the Shanghai Music Conservatory. China have recently brought a lot of business to the city, the duel looks to celebrate the region’s collaboration with China and looks to bring local businesses together across the city. Individual profiles of the boxers from the GB Boxing squad are available at http://www.gbboxing.org.uk/gb-boxing-squad/podium-squad/. Results and updates on the team will be posted at www.gbboxing.org.uk and on twitter at @gbboxing.